Many cities have passed an ordinance to require that all single-stall restrooms in businesses and places of public accommodation be gender-neutral. The ordinance applies to existing and future single-stall restrooms - defined as intended for use by one person at a time — in food and commercial establishments, retail locations, and City facilities. Existing businesses are afforded a 60-day period in order to make necessary changes to comply with the ordinance; new businesses are required to comply immediately. 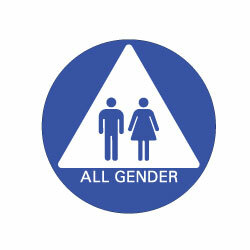 Our made-in-Califronia ADA Compliant Restroom Signs are high-quality and professionally manufactured. Our ADA Restroom Signs meet ADA sign regulations and will pass official Title 24 building inspections and Americans With Disabilities Act compliance inspections. "Thanks for the quick shipment and response." ADA Restroom Signs Mounting Instructions: Where permanent identification signs are provided for rooms and spaces, signs shall be installed on the wall adjacent to the latch side of the door. Where there is no wall space on the latch side, including at double leaf doors, signs shall be placed on the nearest adjacent wall, preferably on the Right. Mounting height shall be 60 inches above the finish floor to the centerline of the sign. Mounting location shall be determined so that a person may approach within 3 inches of signage without encountering protruding objects or standing within the Swing of a door.